EDWARDS AFB – A sea of cardboard, tri-fold presentations filled the Desert High Scorpitorium recently for the Annual Science Fair. This year, there were 143 projects, some completed by teams. A panel of 25 community professionals served as judges for the fair. “The Science Fair represents a lot of hard work and man hours,” said Mark Grubb, Chemistry and Physics instructor at Desert High School. 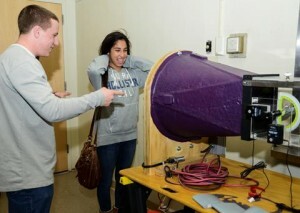 Charles Dobbin demonstrates his wind tunnel to another student at the Science Fair. The fair is mandatory and counts as a test grade for students enrolled in chemistry, biology, anatomy and physics classes. 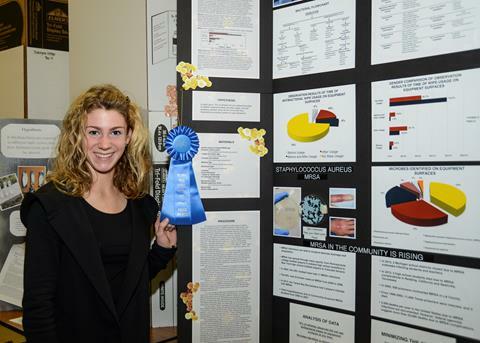 According to Debbie Lewis, Biology and Anatomy teacher at DHS, the science fair teaches students how to start a project and stick to it. 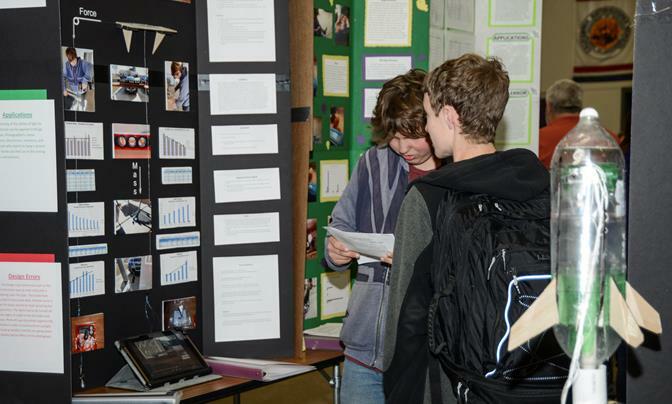 Grubb and Lewis have been grading science fair projects for more than 16 years. According to Grubb, they “stage the process” giving specific dates for the project idea, abstract and final project and report. He added that a good science fair project will rigorously follow the scientific method. They need to collect data, display it and develop a conclusion about the hypothesis and then see if the data supports it. He added that he would like to see even more support from the Edwards Community in the science fair. “People need to know how to make rational decisions and follow logical steps to a rational decision that’s based on real, defensible data. Not based on how you feel, or what it looks like or that it’s sparkly,” said Grubb. Charles Dobbin received a second place ribbon for his project. He tested various air foils and observed their lift and drag coefficients, their stall angles and other effects on the wings shape during testing. Dobbin tested the foils in a wind tunnel that he built for last year’s science fair project. 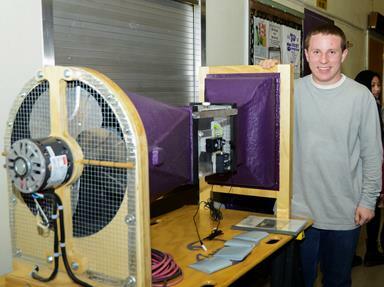 He built the wind tunnel with his father, a program manager in special projects at Edwards. “It’s the same project that I did last year and I realized that there was a lot more that I could do with it. My dad and I started playing around with new stuff that we could do with it and we came up with a new way to mount the foils so that we could measure more,” said Dobbin. He shared that he had learned the basics of flight in his ROTC class and felt well-prepared for the project. During his research, he gained a deeper understanding of the lift coefficient and how to detect stall. 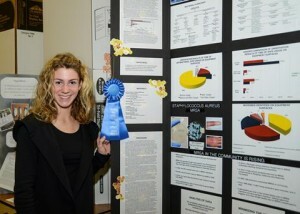 Evey has been studying microbiology for the science fair since her freshmen year. This year, she went into public gyms in the local area and observed whether people used the available disinfecting wipes. She then swabbed the equipment for various bacteria and grew them in an incubator. What she found was a direct correlation between the number of people using wipes and the cleanliness of the facility. Evey received assistance from personnel at the Medical Group in identifying the bacterium. 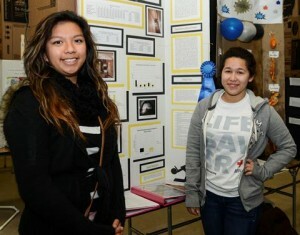 Katherine Lott and Sabrina Belen called their project, “Here Comes the Sun,” another first-place project. The project tested the effectiveness of a helio tracker in comparison with a static solar panel. The helio tracker is a solar panel placed on a platform that follows the sun’s movements to gather more solar energy than a flat or angled solar panel. A helio tracker is normally computer-operated. The one that Lott and Belen tested requires no electronics. “It’s just pressurized bottles connected by a tube which, when the sun would hit the two tubes, it would cause the two panels to move, sort of like a seesaw,” said Lott. Lott and Belen received assistance from Lott’s father, a mechanical engineer at NASA. The final product ended up being one-ninth of the size they had originally intended and they tested it indoors. 2 comments for "Desert High students challenged by science fair"
I would like to see more schools included in this program. I know there are other engineering facilities in the neighborhood that would love to emulate what Edwards Scientists and Engineers have developed; a well thought-out Science Fair. Fantastic job by the students. Congratulations to the winners.